The Enjoy Cycling Triban 3 review. I have been noticing a number of things on my commute along Oxford Road in Manchester some of which are very interesting, some of which are quite startling and others make me curious. One particular thing that has made me very curious is the increasing amount of red bikes I see when travelling to and from Manchester city centre. At first glance these red bikes can be mistaken for good old Specialized Allez, a striking red bike that I have always admired. But on closer inspection it is not an Allez but a Triban 3 which to my amazement looks like a very good bike. The Triban 3 road bike has all but passed me by. I have visited Decathlon sports on a number of occasions and not even looked at the bikes. I have always thought that they would be cheap and nasty and have never given them a second thought until now! It’s clear to see that Triban 3 is growing in popularity so I decided to take a look at the bike. The bike is only available at Decathlon Sports so I decided to head down to my local Decathlon Sports in Stockport to take a closer look. It was clear to see how popular they are as there was a queue of bikes waiting to be checked and picked up from customers. The Sales assistant admitted that the have sold a large amount of these bikes due to the great reviews that have been published. First impressions are that I was impressed, so impressed that I have decided to buy one and publish my own Triban 3 review. I have wanted a winter bike for some time and have been looking for a road bike that will cope with my daily 6 mile each way commute in to Manchester. I have looked at various bikes all of which were an average of £600. These bikes included the Trek 1.1 and the Specialized Allez. A spate of cycle thefts from my work car park has made me reluctant to spend so much on a bike to commute on. This is where the Triban 3 ticks the first box. 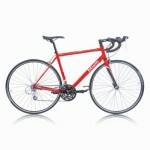 At £299 it looks like a Specialized Allez yet costs 50% less so on cost it seems good value. A bike that look the part but won’t break the bank and cause sleepless nights and an insurance excess if pinched from my so called secure work car park. However I am and always will be a firm believer in the saying “you get what you pay for”. What is the use of a bike that looks good if in reality when ridden is uncomfortable and poorly built. Poor components on a heavy frame is no use to man or beast. At only £299 I was not expecting much from the Triban 3 but I have to say that I am impressed and I think that my expectations have been exceeded. It stands head and shoulders above other racing bikes in its class and in my opinion can match other bikes in the £500 category. Another tick in the box for the Triban is the frame. Aluminium frame with carbon forks make it light as a feather and comfortable ride. The carbon forks offer comfort and light weight which is more than many bikes in its class. There is not another bike that offers carbon forks for this price so the Triban 3 has broken the rules. The Triban 3 road bike offers so much for its price. It comes with a lightweight frame and carbon forks that are comfortable and a pleasure to ride. I find myself eating up the miles and competing with my cycling palls in both speed and looks. The Shimano gear system is similar to that found on a more expensive bike and it also comes with a triple chain set making it an ideal bike for the hills. Being realistic the Triban 3 is no world beater but what it does offer is an affordable way in to road cycling. It is a great commuter bike that eats up the miles. The frame will last and the bike can be upgraded to match more expensive bikes. I have test ridden a number of road bikes over the last 3 months and although the Triban 3 was not my favourite (purely due to brand) it cost £300 less than my favourite. Having ridden the Triban 3 for a number of weeks the only downside I have to point out is the poor quality tyres. The standard rubber is not good but like all tyres they don’t last forever and when you replace them buy better ones. The wheels are not as good as other bikes but this is a small price to pay as they do not affect the overall riding experience. I have had no problems with reliability, so far so good! If you are looking for a way in to road cycling or looking for winter training bike or just have a small budget then the Triban 3 is the bike for you. It is not a Trek or a Specialized so will not suit those brand snobs amongst us. What it will suit is someone looking for a quality bike that offers a great frame and good gear system. Yes upgrades can be purchased to make it better but in the entire bike bought as it is will suit for hundreds of mikes. For me the bike has come in very handy for my commute and it serves this purpose well. I take out for group rides at weekends and in all it’s a great bike that I love. I could say that it’s cheap and cheerful but it’s more than that! Yes it is cheap but it does not feel cheap, it does not look cheap and overall it rides well! What more can I ask for in a bike! It’s all about the ride and I am happy! I hope you enjoyed my Triban 3 review, if you did please share and spread the word. If my Traiban 3 review has inspired you head down to Decathlon Sports to take a test ride.